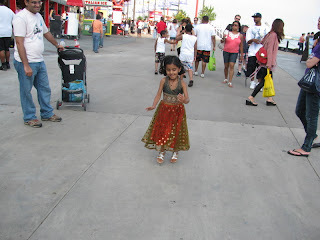 .... laughing and hopping and running and jumping at Navy Pier, in the best of her spirits, way too happy in her very fancy dress which many of the passers by stopped to admire and even comment to us and to her much to her delight, making her declare, as a result that this is all she is ever going to wear wherever she goes. She remains to be very interested in dresses and bangles and hair accessories and all things beautiful which include flowers and clouds in different patterns and bright sunny skies and sand castles and sea shells. She exclaims in sheer glee when she sees a bed of flowers that she has never seen something so beautiful before, revels in the warmth of a pleasant sunny day, enjoys the breeze on her face and through her hair when on a boat in the middle of a lake, and sways in perfect rhythm to a good piece of music, language no bar. While playing with Vansh, she knows that she is the younger one and can get away with a lot of things that he can't or that he'll be told to be more mature if they start fighting and exploits to her advantage many a times. She screams when she wants to get him into trouble making him shout in frustration that he will do the same to get her into trouble. But then basks in the affection he pours on her when she is sulking or pretending to sulk after I get angry with her. Sometimes she quickly takes a thing he really likes and then makes him say please to her a dozen times in a dozen different tones before handing it to him. At other times, she is the best playmate one can ask for. She laughs when Vansh does something to irritate her, telling him how he can say such silly things. Or just starts acting like him and makes him laugh out loud if he gets upset about something. Happy birthday Jiya! You look so so pretty! You make the outfit look gorgeous! :) I hope I get to see you this year along with your brother and mom/dad. Wish you lots of fun this coming year! Neera - am sure there is a lot more to her - I have to compare this to Vansh's four year old post and see if you have done justice! :) But I got an image of how she is really this calm and cool kid. Only diff between Jiya and KG is KG is not the fussy eater here - KB is. Noonoo! Stop being my mean teacher now! And where is today's post btw ;) I wish too that we meet soon ...please please come to Chicago ..u and the kids will love it in the summers. Hah - now that you have asked where is my post - I shall write one just for that ! :))) so many posts in my head - just putting it down is so hard!